Boston & Cleveland, OH: John P. Jewett & Company & Jewett, Proctor and Washington, 1854. 1st. Original boards. First Edition. Small 8vo. xi, 356 pp. Folding hand-colored lithographed map of California with an inset of San Francisco, by J.H. Colton, dated 1854. Publisher's brown blindstamped cloth with gilt lettering and decoration to spine. Previous owner name. Short tears to map; wear to extremities; a very good copy. 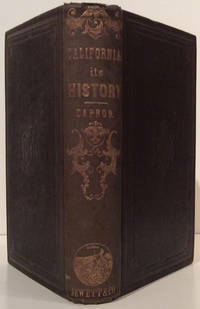 In 1853 Capron went to California as a commercial agent of several large mercantile houses in New York City. He visited the principal cities and villages of the state, and traversed the various mining regions. Besides an in-depth description of San Francisco's lurid side, he gives definitions of various mining techniques, and description of the miners' court, miners' home, and Chinese exclusion. "This work gives extensive treatment to the Mexican War and the conquest of California. Part two gives a detailed description of San Francisco, and part three a description of the gold mines of California" - Hill.254. (Cowan pg. 104; Graff 580; Howes C127; Kurutz 116; Rocq 16759; Sabin 10764; Wheat Gold Regions 254).